Convenient online payments with PayPal or credit cards. Clients have come to expect the convenience of paying invoices online. With Bill4Time, you can offer the ease of accepting online credit card payments through the Bill4Time client portal. It takes just minutes to create an online payment gateway and no technical experience is necessary. 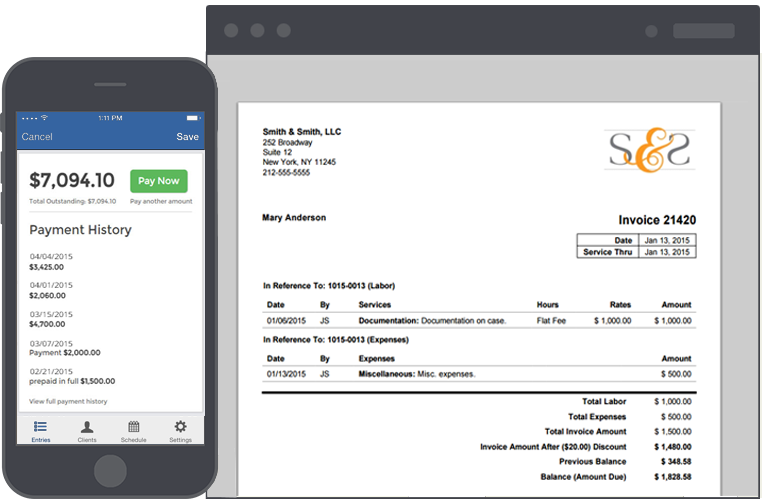 Quickly email invoices with a link to a personalized client portal. Your clients can make full or partial payments, and they'll enjoy the speed, ease and security of paying online. Record billable and non-billable time, separately track internal non client time, and track staff, contractors and consultants for precision accuracy. Offer clients the ease of remitting online payments via credit card or PayPal through any desktop or mobile device. No technical expertise or merchant account is required. Choose to have payments directed to any bank or PayPal account. Know your financial status by simply logging into your dashboard. View accounting data anytime - payment history, trust balance and more. Payments are made through a secure, dedicated client payment portal.